Its the F-i-nal C-ou-nt Down! Earlier in the year, the tea leaves were projecting the markets would enter a new trading multiple, pushing to the high-end of the historic 15-17 trailing price-to-earnings (SP500) range. The markets are pushing that high-end range to the limit. The SP500 for the June quarter and September estimates were taken down (for the reported earnings), and with the revision, the trailing multiple is near 18. 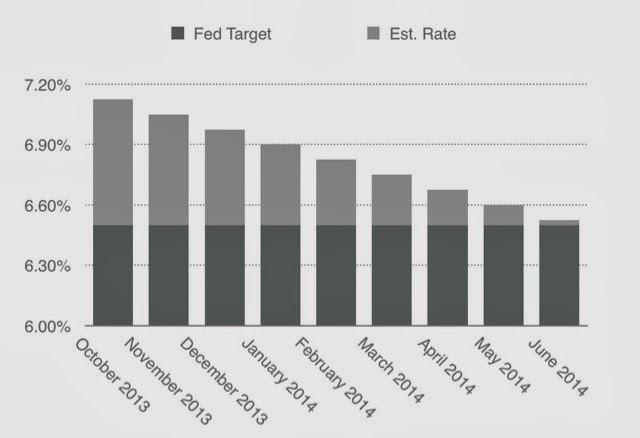 In September, the Fed's meeting minutes were pretty dovish. Surprising given the job data. But if taken at their word, no "easing" until the 6.5% Unemployment Rate target achieved, the markets should enjoy about 9 months of 'higher' multiples. Markets rarely wait for news. Most of the time they anticipate, and the anticipation is usually a few months ahead. After the Fed's green light in April, the markets started to push forward with trailing multiples touching near 18. The markets are already near the high-end. The big $$$$ question is 'when'. When will the markets care? Based on the previous and projected drop of the Unemployment rate, probably some time in late Q1 - early Q2 2014. The guy typing this likes this post.